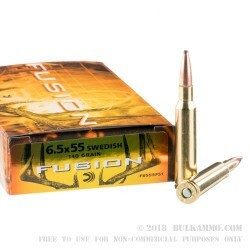 This 6.5x55mm Swedish ammunition comes from the Federal Fusion line with a soft point/skived point and a 140 grain projectile weight in front of clean burning powder with a brass case and a Boxer primer making it easily reloadable. The Federal Fusion line is a powerhouse at a regular (non-premium) price point. 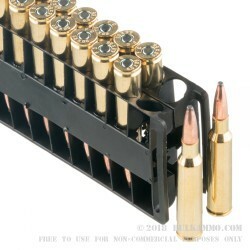 Don’t mistake high prices on rarer cartridges for the premium price points in the market. 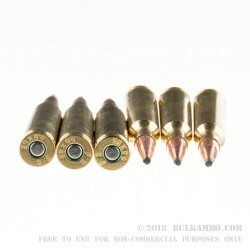 The Fusion can offer better pricing than the top tier engineered bullet cartridges because the production technology, while exciting and new, is significantly less costly than some of the expensive to manufacture bullets. Performance is just about at parity too, for hunting purposes. The Fusion bullet is a special component; utilizing an electrochemically plated bullet that has a lead core to ensure jacket separation is a thing of the past. This also ensures that the retained final weight of an impacted projectile is higher, meaning you get more energy impact on target and better stopping power. The percentage of “die where they stand” game animals is going up as we speak. The Skived bullet point offers a predictable deformation and expansion and the combined wound channel, retained weight and energy delivery through bone and muscle offers a devastating stopping force on game animals.